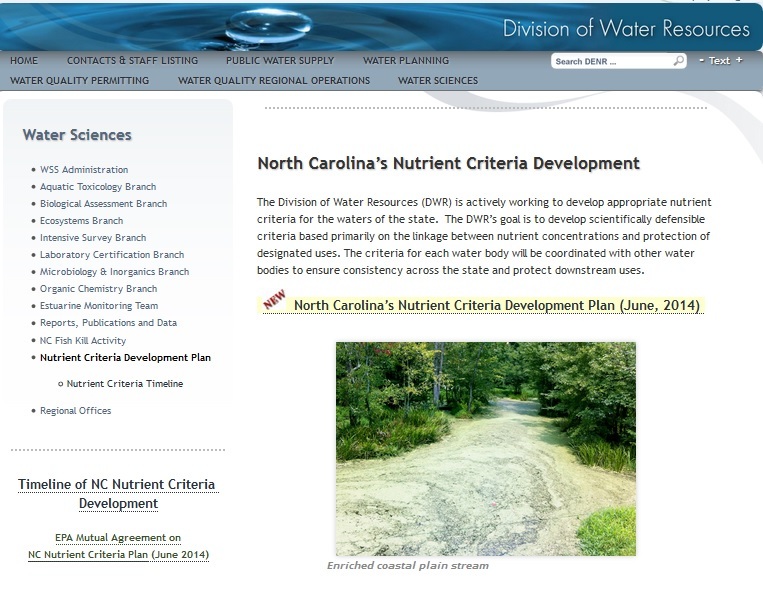 NC’s Environmental Management Commission (EMC) recently heard the State’s plan to address problems associated with excess nutrients polluting the State’s waters. The State has been butting its head against a wall on this issue for over a decade. The last effort at this plan was approved by the EPA in 2004. Some of its elements were implemented but others got stuck and never made it out of the rulemaking process due to concerns over fairness, cost, and a thorough vetting of alternatives. The best example of this being the Division’s attempt at a more proactive approach to controlling pollution via the ‘Threshold Rules’ that were presented to, and batted back by, the EMC several times between 2009 and 2011. Fast forward to the current plan released by the Division of Water Resources and approved by the EPA earlier this summer. It puts out milestones over the next 5 years for the Division to take action in new water bodies of High Rock Lake, Albermarle Sound, and the Middle Cape Fear River. Concurrently, a Scientific Advisory Council will work with the Division to help sift through the data the evolving science to help guide decision-making on water quality, monitoring, and pollution reduction. One hurdle to overcome with the State’s effort to create a more proactive strategy for dealing with nutrients is the political headwinds such a plan would face. Current plans such as that for Jordan Lake took 6 years to get approval and have been modified in the legislature multiple times since they were approved in 2009. Indeed, in 2013 they were nearly repealed but a late compromise was instituted that led to another 3 year delay in their implementation and funded water circulation technology as an alternative treatment solution for the Lake. Absent a critical event, such as that for Toledo, the Division will find many political as well as scientific challenges to implementing more proactive approaches to curbing nutrient pollution in the State.